It’s that time of the year again, when numerous factors seem to conspire to get us sick. And though most Americans still walk into a drugstore for relief, more and more folks are waking up to the fact that symptom suppression, like that found in decongestants, does nothing for the root cause of the problem. The downside to this symptomatic suppression approach is that it may drive the condition deeper into the body only to be manifested worse at a later date. The good news is that you can walk into any health food store and find a myriad of cold & flu fighters as well as immune supporting products that work more with the body rather than by suppressing it. There is one supplement that stands out though – Propolis. While Propolis has a diverse mix of non-immune healing actions (which we will explore in future issues), it is the immune related ones we will focus on here. Historically many of the cultures that utilize Propolis did so, often primarily, for its immune and anti-microbial actions (see Propolis Throughout History). Propolis offers a built-in holistic approach to keeping us healthy through the cold & flu season. First and foremost is its ability to support, activate, and boost our body’s natural defenses. It increases the number of immune cells, boosts immune cell activities, ups antibody production, activates macrophages (increasing numbers, responsiveness, and bacteria killing) and increases Natural Killer cell activity. What this means for you is that Propolis works with your body’s natural immune defenses helping you resist these microbial invaders. A healthier more rigorous immune system also means your odds of catching a cold or flu are less likely. And, if you do get sick, your body is in a better position to battle the offending agents resulting in a shorter duration of the illness, along with milder symptoms. All this because your immune system is now doing the job. 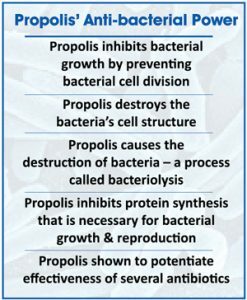 Not only does Propolis produce these direct attacks on bacteria, several studies have shown that it can actually potentiate the beneficial effect of several antibiotics along with preventing or reducing an individual’s tolerance build-up to antibiotics. Thankfully, especially this time of year, it is good to know that Propolis offers somewhat similar support in our efforts to fend off cold & flu viruses. Key to Propolis’ anti-viral benefits is that it works in several ways and on multiple levels. (See Anti-viral Super Hero insert) By attacking the virus by means of several mechanisms you increase the likelihood of defeating the viral invaders at the same time you decrease the likelihood of the viruses developing resistance. It’s cyto-protective actions help prevent viruses from entering and taking over our cells, which they need to do in order to replicate and thrive. In doing this, Propolis becomes a helpful ally in viral prevention – so don’t wait to get sick before you start taking your Propolis. Research confirms the practical anti-microbial applications of Propolis, demonstrating effectiveness internally and topically (by means of a nasal spray) for relief from sinus infections. Another study found benefits for respiratory infections using a product that has been employed in Europe for years and is now available in the U.S. In animal studies looking at its effects in deadly influenza, researchers found it decreased mortality while increasing survival time. A number of symptoms have been found to be relieved with the use of Propolis, including fever, headaches, body aches, coughing, and sneezing, demonstrating surprising effectiveness at this. Also a Russian study of 260 patients saw a reduction in sore throats and coughs in 90% of cases. Showing that Propolis “plays well with others” an Israeli study of 400 children used Propolis, Echinacea, and Vitamin C to shorten duration and lessen severity of symptoms. Propolis is yet another example of the amazing health and healing potential that nature makes available to us. It brings potent preventive actions to the cold & flu battle – which after all, is the best kind of medicine. Propolis offers powerful and effective immune support while targeting bacterial and viral invaders in a number of different ways. All this adds up to a powerful healing ally that can help us through the cold & flu season. And keep in mind, there is no better time than the present to get started on an immune and health-supporting program utilizing the effective and versatile Propolis.